In the past half century, I have gone three times to hear Mahler’s Das Lied von der Erde (Song of the Earth) played at Vienna’s Musikverein. Each time I have gone, something bad has happened. Tonight, with some trepidation, I am planning to go a fourth time to hear this music performed. I keep wondering what will go wrong this time. The first time I went to the Musikverein to hear Das Lied von der Erde (DLvdE) was in 1968 when I was an undergraduate student in Vienna and was able to get tickets to hear the Vienna Philharmonic play the music, conducted by no less than Leonard Bernstein. My seat was on the podium, sitting in a folding chair behind the musicians, facing the conductor. To maximize seating for the concert, about five rows of such chairs had been placed on the left and right edges of the back of the podium. The concert was a thrilling event, as you would expect with a world class orchestra, two talented singers, and a world-famous conductor playing some brilliant, though sometimes dark, music. The last movement – quite long – is entitled “Der Abschied,” the farewell. It ends with some very subdued, foreboding music, accompanying one of the singers who repeats the word “ewig” (forever or endless) many times; each time the word sounds more forlorn than the previous time it was sung. The conclusion is engrossing, as one contemplates eternity with each tortured syllable. Or at least it was at this concert until a guy sitting in front of me on the podium, fell out of his chair, breaking the stillness with a huge clatter. Initially I was afraid the guy had just gone to eternity; after he hopped up and resumed his seat – hundreds of pairs of eye following his every move, a part of me wished he had. The second time I went to hear DLvdE performed was in late fall, 1971. I was back in Vienna as a graduate student and felt fortunate that a woman I had known – and dated a few times at the University of Arkansas -- had come to the city to visit for a few months. A blond, free spirited beauty (she was one of the “Razorback beauties” in the university’s 1970 yearbook), she accompanied me to hear a concert featuring DLvdE. This time, the concert went smoothly, featuring a strong team playing and singing the beautiful music. The problem came afterwards, when I and my date, along with a couple friends, went to the Café Hawelka, a hangout for students and intellectuals. “Fortune was not kind to me in this world! Where do I go? I am departing, I wander in the mountains. I am seeking rest for my lonely heart. I am making my way to my home, my abode. I shall never stray far away. My heart is still and awaits its moment. She was lost before he got to the next words: “ewige….ewige…..ewige…….….” I didn’t see too much of her after that. She and the kind translator had a good time together during her remaining weeks in the city. It should be understandable why I did not rush back to hear DLvdE again after my 1971 experience. However, last year, forty years after the unfortunate events at Café Hawelka, I decided to give it a try. During my stay in Vienna, the Gustav Mahler Jugendorchester (Youth Orchestra) was scheduled to play both Mahler’s Eighth Symphony and DLvdE. I bought standing room tickets for the concert and went with a former college roommate, recently retired, who I was helping to see Vienna for the first time. Fortunately, some nearby folks helped my friend regain consciousness, loosening his tie, fanning him, giving him some water. I was preparing to drag him out to the hallway when he was able to get to his feet. A doctor came and insisted that he get fresh air, so we parked ourselves near a window. After observing him a few minutes, she decided he was fine, just overcome by the heat. When he was sufficiently recovered, and just before the orchestra started playing DLvdE, I went with him to make sure he got back to the apartment without difficulty. 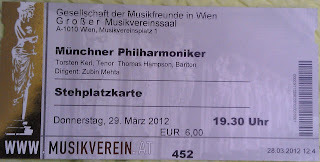 I read later that the Mahler Jugendorchester was particularly good that night when they performed DLvdE. Tonight, my fourth occasion to attend a concert that includes DLvdE in its program, is ripe for disaster. 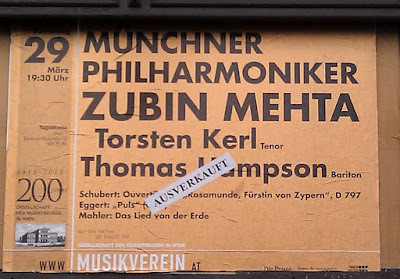 It will be performed by a world class orchestra (the Munich Philharmonic) and conducted by Zubin Mehta, one of the best known conductors in the world. I will be back in the standing room section where last year’s collapse occurred. It will be crowded on this warm day. I’m not sure what will go wrong, but if you read about some strange disturbance in Vienna’s Musikverein on March 29th, you should see my name in the story somewhere.